"Inspired by castles and castellations, Maggie worked with the whole of Years 5 and 6 and together we built a castle wall in the playground using concrete, ceramic and mosaics. This has since become a well loved quiet play area. " AN OLD SHED GETS A NEW FACE! After (top) and before (below). 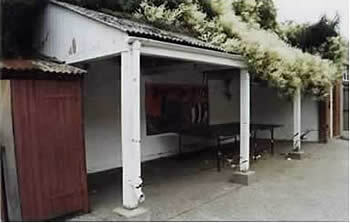 This old bicycle shed has a new life at North Junior School, Colchester. 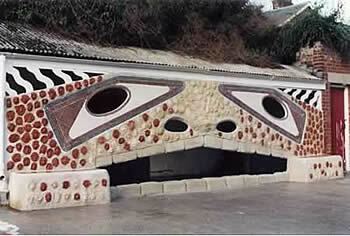 It used a variety of techniques and materials including thermolight blocks, concrete, ceramics, wood and mosaics. The reddish circular shapes are actually ceramic faces that the children made, and we included a seat at both ends.